Last month I was really depressed. I was burned out. I wasn’t excited to do the things that people do. The dark thoughts were there. Unfortunately, a lot of that is still true this month. I’ve been taking steps to mitigate these feelings. I’ve kept going, despite not wanting to. And there are projects that I am making progress on. It’s slowly moving me towards a better version of life, but I still am not able to break out of the depressive thinking– at least not fully. I submitted a manuscript. I’m not excited about it, though. I co-wrote an article for the National Postdoc Association Newsletter. I’m a little more excited about that. I wrote one of my more ambitious posts on Quiet Branches, linking the past to the present. I sought input from an author of a study and did a lot more research than I have put in the past. I’m pretty proud of it. And I got asked to have my blog brought into a blog network, which is exciting. It does feel validating, that maybe I am a “real” science writer. I went to the Future of Research Conference for a day in Boston, which was really good. I networked! (I got a free book on storytelling in scientific publications from Rafael Luna of Harvard Med School!). I’m glad I took a long day to go. I even applied for something, putting together a cover letter, resume, and a writing sample in a few hours. Whether I get the gig or not, I feel like putting that together that quickly is real progress. These are the good things that happened last month and a half. I’m sure there are others, but as you can see, a lot of them still revolve around work, side projects (that I do love), and little outside of that. How do I move forward from here? Where do I go? I’m still frazzled. I’ve tried taking care of myself better with some success. I’m not exercising enough, running hasn’t happened other than a few short runs and one short race on a perfect fall day. And as both commenters to my last blog post here noted, this is a long battle. Self-compassion matters. Having access to a therapist is important too (I am lucky in this regard). And taking time off, which I have done a bit of, feels more like my body telling my brain to take a break. And I even have a tiny in-real-life social life. I have gotten better about asking for things and I don’t really fear rejection in most contexts, it’s just something that I find likely to occur still and am pleasantly surprised when it doesn’t. Hopefully, I am learning. I hope I’m putting better content into my brain than bad. Garbage in, garbage out, as they say. It doesn’t help that the garbage can come from inside my own brain at times. Am I just being busy for the sake of busy? Am I just distracting myself from what I should be doing? Am I just stubborn (tenacious maybe the more positive spin on that)? These are questions I keep asking myself. Life goes on. I am trying to keep up. And keep swimming. Author Ian StreetPosted on October 28, 2015 October 28, 2015 Categories UncategorizedTags Academia, anxiety, burn out, depression, postdoc experience, science, Science Careers, Science Culture1 Comment on Getting Convinced. I recently learned the word inelcutable. It has the same latin root as reluctant. Luctari, or “to struggle”. The word means unavoidable or inescapable. The inelcutable sunrise. I heard it on an NPR radio show ‘A Way With Words’ all about language. and the way it was described, when I heard it, really struck me. I was tired and it was 6:30am when I heard it, so the first thing I had to do was to figure out what the word was. I didn’t get it at first, but luckily in this era of podcasts, I found the episode and the word a few days later. It brought up for me the frustrations I’m having being a postdoc, trying to figure out how to have a career beyond it and just the sense that for me, it seems that a lack of change is ineluctable. I’ve been working to manage depression and do other things to improve life. Be present. Meditate. Exercise. Learn new things via the growth mindset. Take risks. Get out of my comfort zone. I have done a lot of these things and maybe I need to do it more, or better, or differently, but not much has changed. And that’s frustrating. I am still trying, but it still feels like outward change is simply not possible. I am writing more. I am engaged in several fun side projects and I am trying to learn some new things too. And I think I’m networking. There was a discussion on Twitter yesterday about how academics rely too much on external validation, don’t act on our own intuition, and are risk averse/not resilient. The first two are true of me, certainly. I have tried to cultivate my own internal sense of intuition and to trust myself more, but still have a long way to go and may need to be out of academia to really instill that in myself. Risk aversion is still true of me…except when I’m talking openly about depression on the internet (which may not be a real risk, just plain stupid…seems to be a fine line). I live in fear of becoming someone obsolete, just eking by…which I kind of do now, but it feels better than that. I do live rather minimally, but aspire to more. Resilience is something I think I may actually have. I (so far) have successfully been managing depression and slowly coming back to life from having stalled a few years ago. I still feel grey and not vital, with an internal drive for life, experiences, enjoyment, etc. but one reason I’m anxious for change is so that maybe a new place will spark that in me again (I know, I’ll always be carrying my own brain, which may be problematic). I still think academia is not the best place for good mental health (unless you’ve made tenure, perhaps). And leaving may be the best thing for my soul. I don’t want to ever feel the ineluctable conclusion is figuring out how to remove myself from the gene pool. And I still feel too close to that thinking. And that is scary to me. And while I hope I’m alone in thinking that about myself, I’m sure there are other academics that may be thinking along similar lines and that is why I write this blog. We’re not alone. Despite frustration. I still am not giving up. I don’t know why. I do have some people that still care about me, for one, and I still feel like I can be useful…somewhere. Maybe a connection I make, maybe something I write, taking a chance. I think I’m willing to do the work. I just also need to pair it with a life as well. I hope that that is an ineluctable outcome. Author Ian StreetPosted on April 17, 2015 April 17, 2015 Categories 2015, Academia, anxiety, career, Ian 3.0, Postdoc, postdoc experience, science culture, showing up, trial and error, Uncategorized, vulnerabilityTags Academia, anxiety, Application for employment, Blogging, Career, Daring Greatly, depression, Growth mindset, Ian 3.0, Mental health, Postdoc, Science Careers, Science Culture, STEM, vulnerabilityLeave a comment on ineluctable. I still see signs of depression in my brain. That’s hard for me to admit since I’ve been working to manage better for years. Lately, I feel exhausted and frustrated with myself though. What do I feel about things? I still feel anxious at times, but more than anything, I do have “empty” feelings. There’s emotion there, but it’s a null set, or at least that’s how it feels to me; it’s a perception problem. It’s like there’s an empty place in my chest (and I know, that’s not where feelings come from). These have intensified recently. I really question if I can improve my skills, have I been learning? I only have a limited lifetime, so just when does hopefulness and optimism become more default? Can life get better? my honest answer is “probably not” right now, at my best it’s a “maybe”. Yes, yes, and yessish…this last one is where I feel it sometimes, but know there are things I can do and actually do do sometimes. Am I improving, growing? The feeling I have is one of being stagnant. What do I enjoy doing? And am I doing those things? Often no. It always seems like the effort and time are crushing constraints. And it feels like anything I do isn’t fun/pleasurable, exactly, it’s just something I do. Yes, and yes. This may be getting less sleep, but I rarely feel energetic or excited. Yes, possibly (I don’t seem to care about details in too many situations), and yes, decision making is still really hard for me; even small ones. I am up past midnight most nights, I wake up around 5am most mornings, try to sleep til 6 at least or 7…then the cat insists I get up to feed him. I have eaten less this year. I think I’ve lost weight, though I haven’t stepped on a scale lately. Unfortunately, yes. the former. They’re not insistent, nor do I take them at face value; they’re thoughts that come up and I dismiss them as temporary, fleeting, but my sense is healthy people do not have these thoughts. And they aren’t thoughts I would act on. Unsure on this one. It is perfectly possible. I have aches, pains, headaches, and more; but that may be due to exercise and not taking the best care of myself. So given these signs, how can I say I’m doing better? I still feel like there’s a gap between reality and my perceived reality. Making time for meditation/mindfulness may help; it’s something I’ve gotten away from the last few months. And how do I experiment more to figure out how to get myself into feeling better? But this assessment just goes to show the the road from feeling crushingly depressed is a long one. I’m not completely under its false narratives anymore, but still haven’t totally given way to new ways of thinking, cultivating a healthier mindset. The component I’m missing may well be social too. I need to interact more with other people, the world, engage in real life with fellow human beings. I do this in fits and starts now, but I hope I can do it more often. I am still scared of spreading my depression to someone else. Trust me, I don’t wish the depressive thinking pattern on anyone. I know things take time. But it is frustrating to realize I still have these feelings, even a year after feeling like I’d made a lot of progress. And in some ways I have, really. I am better at recognizing and addressing my depressive thinking in my own brain. And I am more anxious than ever about being open about it (hello insurance cos and potential employers! I’m self-disclosing medical info! But you know, it shows I’m a bold person…so that’s good, right?). But here I am, showing up, telling the internet how I am doing. I hope it helps someone. Author Ian StreetPosted on March 30, 2015 March 30, 2015 Categories 2015, depression, Doing something, growth mindset, Ian 3.0Tags anxiety, depression, Ian 3.0, Impostor syndrome, learning, Mental health, vulnerabilityLeave a comment on Closing the gap. The answer to life, the universe, and everything (not really). I’ve been quiet here lately. But I’ve had things going on. Go check out my other blog The Quiet Branches where I write about plant science each week– it’s been a fun project. Then it has also been a crazy few months in the lab trying to meet several deadlines. And I’ve been taking more online classes. One in learning R and statistics…it’s only going OK on that front. The time it takes to concentrate and truly internalize everything is probably more than I actually have, but I think I am picking up a few things at least. I need a career and to feel like I have a life. It’s been really hard to sense that I do have a life even though I know the mere passage of time that I am aware of is life. I realize I’m not entitled to anything. I am grateful for what I have. This is a call for more humanity out there. It may be there. I just can’t detect it because of where I am or maybe I have faulty sensors. I find it sometimes though. I’ve been thinking a lot about work and how I really want to carve out a space to not make it all of who I am anymore. In fact, it cannot be all that I am anymore. That will kill me. I am more than my work. Setting that boundary is difficult and doesn’t seem all that acceptable in the world of work today. Companies/employers are not your friend. And will basically take whatever they can get from you of value. And they don’t care what your life is outside of work so long as it doesn’t interfere with your work. I’m sure I’m not the first to notice the blurred lines of work and life in modern times. And it seems like there is little slack for life events these days as a lot of us try to do as much as possible to prove our worth. At Tenure She Wrote, @SciTriGrrl wrote a post a few weeks ago about time management and carving out time for people that priorities at work that are truly important. Prioritize until it hurts is something I’ve heard entrepreneurs say. Everything will be OK…unless something goes wrong. Perhaps it’s possible to work through that fever. The science must go on. In the entertainment/creative/pro-sports industries, they work sick all the time I hear. Unless you really can’t get out of bed, your’e at work. At least in those industries, they have brief periods of intensity and then they’re off for a time until the next job comes along and it’s intense again for a period of time. I’m not sure science is quite like that. If you can’t get out of bed due to illness for a day or two…maybe you’re not cut out for being in that industry. Now let’s say it’s not the flu, but depression or other mental illness that you’re working to manage. Or imagine a sick kiddo and need to stay home with them. I fear the mantra of “you only have value if you work” is the only acceptable way to have value in today’s world (at least in the US). It’s OK until some challenging thing happens and knocks you out of the game, no matter how resilient a person you are. It’s like species being able to adapt to climate change. Some species undoubtedly will be fine and adapt quickly enough to the rate of change. Internal value doesn’t matter. The fact that I am enriching myself by reading ,writing, learning stats/R/coding at some level despite the fact that I’ll never likely be a master of any of it, trying to socialize more, being a decent person, helping friends do things. I hope these things are valuable. But fear they’re not. In and of themselves, they don’t produce money and therefore are not valuable. It is a hard mental habit to break. I have to find evidence to reject the null hypothesis that I am not lifeless. If the goal is to prove your’e so valuable and in demand that you never have to worry about anything ever, do you get to take breaks? Ask for help? Or is asking for help saying you can’t do things on your own, acknowledging humanity, and there’s just not room for that in the world. Humanity is not valuable. Except that it is, of course. Why are we working except to keep humanity going. Even for-profit industry has a component of providing a service to the world. Look like your’e interested, but not too interested, you don’t want to seem desperate, but also not completely aloof either. Where’s the right line? When do you cross it? All the above thoughts indicates that I probably need to socialize more with close friends. Vacation. Something restorative I haven’t had in quite awhile. Being human in front of another human, not a robot. I want a pub trivia team to go out with and have fun. And I haven’t been able to build one so far. But it will be a part of my life some how. Until then, I have Good Job, Brain at least. What is it I do that no one else can? I freely admit my struggles on the internet…that I’m human. I don’t think I’m alone or remarkable for that. I hope I’m not alone in my thoughts. I have learned to manage my depression, which is not nothing, but again, I don’t think anyone actually cares about that. I can write a lot of words. I can listen. I can synthesize ideas, edit writing, and think about the bigger picture as well as sweat details. Perhaps sweating details way too much. I think things through and am deliberate (which I honestly do not feel is of any value in the fast-paced world of today). I can take a lot of punishment and push myself hard when needed, but certainly need recovery time too. I’m human. I’m sorry if that’s an inconvenience for the world. Just where do I fit? What exactly do I need to get there? The science verse is big. I hear there is something beyond it, but it’s a horizon that doesn’t feel open to me right now. 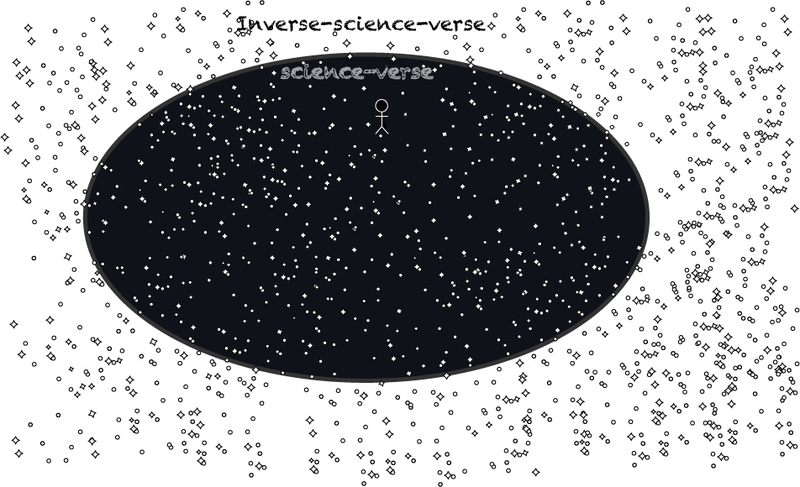 Is there an invisible black hole holding me in the science-verse? So much within it I haven’t explored either. What is beyond? I am trying to see and navigate that way. I just hope I can land there, realize there’s some slack in the line where I can work hard, but have a life outside too (my cat demands it…and having time to do taxes is important too). Heck, even staying somewhere in the vast science-verse would be OK with me. I just feel my value lies not at the bench, but in helping others do great work. Author Ian StreetPosted on March 20, 2015 Categories 2015, Academia, anxiety, ask, career, comfort zone, creativity, Daring Greatly, data analysis, depression, disconnection, good habits, growth mindset, Ian 3.0, impostor syndrome, Introversion, learning, Learning deeply, mindfulness., perfectionism, Postdoc, postdoc experience, science, science careers, science culture, Sustainability, teaching, the universe, vulnerability, writingTags Academia, anxiety, Career, Daring Greatly, depression, Growth mindset, Ian 3.0, Impostor syndrome, Mental health, Postdoc, postdoc experience, science, Science Careers, Science Culture, STEM, vulnerability, Work, writingLeave a comment on The answer to life, the universe, and everything (not really). Yesterday, I was grooving to music, I was feeling energized and OK about the week. There was a picture of a weasel that jumped on top of a flying woodpecker. I was exhausted, but not bad. It was a long day in the lab. I talked about the science and safety behind GMOs and how possibly, a corporation that makes GMO plants could be compatible with a sustainable and environmentally friendly food system (assuming not all of us are going back to growing all our own food again in the world). I had to help an undergrad, my experiment that I needed for a deadline I’m trying to meet didn’t work out. This in light of Bill Nye’s apparent change of mind about GM technology and how it may not spell environmental doom (he always struck me as one suspicious of a for-profit business being in charge of food…not that it was inherently unsafe). I am a bit jealous that Bill Nye got to visit Monsanto…if I could have a job where I get to visit biotech companies for a living, I’d take it. I loved my tour of New England Biolabs last year. I listened to Cara Santa Maria’s Talk Nerdy podcast eps from the last two weeks. Indre Viskontes and Joe Palca were the guests talking about their careers, science communication, and paying for it. Dr. Viskontes made the point that in a competitive world it makes sense to do the thing your’e great at…because then you’re competitive. And especially in underfunded fields like science communication, that’s probably true. What am I great at, though? Have I gotten good at something in my life? What do I passionately care about? I still feel disconnected from a sense of that. Is it a vestige of depression, or am I just one of those passionless people? I read Terry McGlynn’s post about Moneyball and what it might teach academia. How best to measure academics? Efficiency, effectiveness, results, papers? How much pressure do we put on one person to do all the things? What if you’re better at some things than others? How does it all balance out? And how do you figure out if you’re a good fit? And then I heard Sweet Briar University was shutting it’s doors at the end of this semester. I know many alumnae of Sweet Briar, though am not very familiar with the institution other than it’s a small liberal arts college in Virginia. And that it’s an institution a little like the one I went to in Salem, OR, Willamette University (I donate what I can to them…but I’m a poor postdoc still). The SLAC or PUI is the kind of institution I would like to work, if I were to become a faculty person. And due to economic strains I was not fully aware that some at least (perhaps many?) have been under. I feel sad for my friends losing the site of their alma mater (they’ll at least always have their memories of the place together), the faculty and staff at Sweet Briar, but also am mourning what seems like a loss to higher education and perhaps realizing more strongly than ever that my place doesn’t feel like it’s in the academy anymore, but I don’t know where my place is. I still have a hard time articulating why I’m valuable to myself, let alone to a place where I’d work. Because fundamentally, that’s what we do in work, ideally, add value (or at least reduce costs). And hopefully we solve people’s problems without resorting to trickery/deception/bad business practices. I like to write. And maybe there’s a career in that somewhere. Or marketing…I love spreading ideas, but a good product is worthwhile too. Mostly, I want time to be able to think and process. And to integrate a life outside of work into my schedule of work (not balance, exactly, but you know, it’d be nice to try dating again…maybe see friends on a regular basis; maybe the only way that happens is if you work with your friends now). We are nowhere close to equitably spreading resources around. And it seems increasingly true that there are a few winners, and the rest lose out. There will always be hard choices to make in resource allocation, but I hope teaching, spreading knowledge, and pursuit of the intellectual things that enrich and advance our society (including science & humanities) don’t go away from the world completely. I still need to figure out a plan. And a long day in lab didn’t feel like I was moving towards it. Author Ian StreetPosted on March 4, 2015 March 4, 2015 Categories Academia, Biotechnology, growth mindset, Higher education, science, science careers, showing up, Small Liberal Arts College, STEM, Sweet BriarTags Academia, Agriculture, anxiety, Ask, Blogging, boxes, brain, Career, Postdoc, postdoc experience, science, STEMLeave a comment on Thoughts at the end of a long day.